Every Friday, Palestinians, internationals, and Israeli nonviolent activists gather in the Southern villages of Bethlehem to protest against the building of the Apartheid Wall that will eventually destroy the livelihood of these villages. This Friday [April 20, 2007], the protest began with a silent procession by the group of about fifty participants. We carried banners and leaflets with the Virginia Tech logo and statements supporting them in this time of pain. Thirty two olive trees were also carried in the procession to remember each person killed in the massacre. 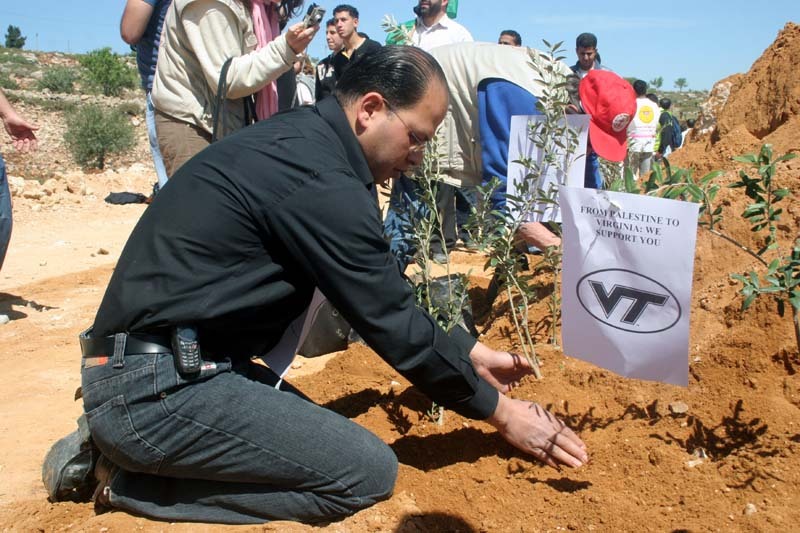 The olive tree is a global symbol of peace and hope. Once we reached the path created by the by the bulldozers for the building of the Apartheid Wall we dug the earth and plated the thirty two olive trees in a row - instead of building an ugly wall that divides people, let us plant trees that bring people together. Brent Jesiek, “From Palestine to Virginia Tech,” The April 16 Archive, accessed April 18, 2019, http://www.april16archive.org/items/show/1045.